Real Housewives of New Jersey’s Teresa Giudice is close to being fired. Tre may not be the most likable member of the cast, but she sure has one hell of a storyline which is clearly the only reason Bravo has kept her around. But, it’s not secret that despite Teresa and Joe Giudice’s legal drama, the RHONJ ratings have been slipping during their current season. Bravo producers have even brought Jacqueline Laurita back in for filming in hopes of saving the sinking reality TV show. Teresa and Joe Giudice are scheduled to be sentenced in September for their numerous charges of defrauding the government and banks. There is a good chance that one or even both of them will be headed to prison, although Teresa is hopeful she can squeak by with a house arrest sentencing. Rumor has it that Teresa is actually refusing to tape scenes for RHONJ because she wants to spend more time with her children off camera before she possibly goes to prison. And, that is not settling well with producers. The only reason they kept Teresa Giudice and her scam-artist hubby around was because they thought their legal woes would help ratings, and they aren’t. But, Teresa’s ego is so large she thinks she can pick and choose when she films and what she films, and that isn’t the case anymore. Teresa’s criminal activities are actually turning off a lot of viewers, so Bravo could care less if they lose her at this point, which means she is in no position to be making demands regarding filming. A source close to the reality TV show tells CDL that they are actually talking about firing Teresa if she doesn’t go to prison, because they think she may be what is harming ratings. 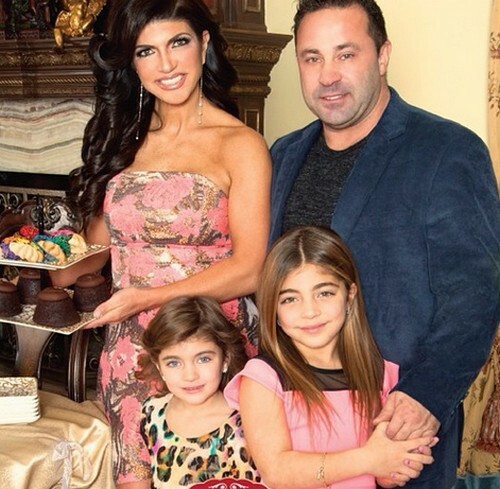 Do you think that Teresa and Joe Giudice are harming RHONJ’s ratings or helping them? Would you like to see Teresa and Joe fired, or do you want them to stay on the show? Let u sknow what you think in the comments below! Teresa Giudice Fired From Real Housewives of New Jersey – Future on Show Uncertain?